Check back here for updates as the date draws closer. James J. Doty was a local open-water swimming legend; there isn’t a body of water in New England that Jim didn't swim over the course of his lengthy career. In addition to completing a staggering number of marathon swims over several decades, Jim was also dedicated to offering more swimming opportunities to others. To further this mission, he formed the New England Marathon Swimming Association (NEMSA), a non-profit organization dedicated to promoting swimming and a clean environment in New England waters. (NEMSA has since become the New England Open Water Swimming Association, which continues to offer open water opportunities throughout New England.) Jim also revived the Boston Light Swim, America's oldest open water race, in the mid-1970s after a long hiatus. The annual Jim Doty Memorial Mile is a small gesture to honor Jim's impressive open water legacy. The Doty swim is an informal, one-mile swim held in memory of James Doty. Wetsuits are encouraged. This is a great starter open water event for athletes making the transition to triathlon, open water newbies, kids, and swimmers who might be a little anxious about leaving the chlorinated confines of the pool behind. L Street Bathhouse (Curley Community Center, 1663 Columbia Road, Boston, MA 02127). Head for the K Street entrance--this is the women's side of the facility. $10 fee with online registration or $20 on the beach day of the swim. Jim never liked collecting fees for the swims he ran (usually $0.50 or $1.00) and in that spirit, we're hosting the swim with a minimal registration fee. 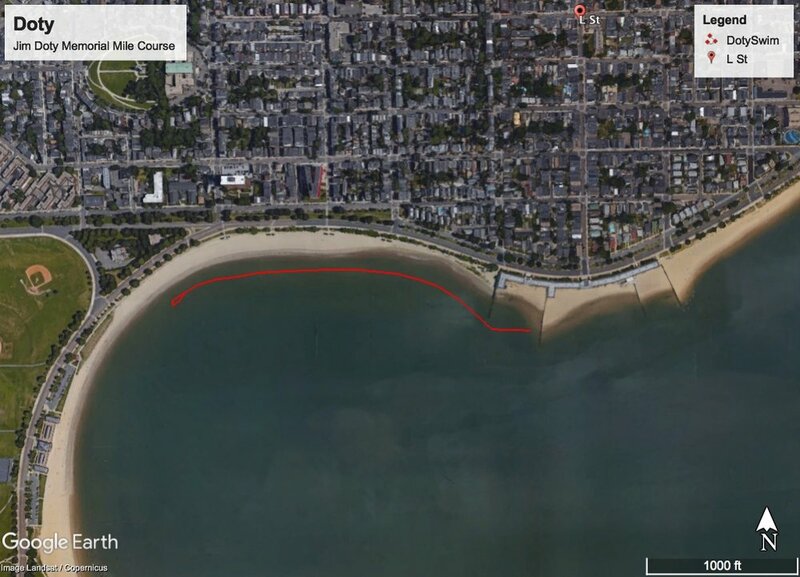 Swimmers proceed from the K St. beach west along the shore toward Carson Beach for 1/2 mile, around a marker and return to the start. Swimmers should aim to stay no farther than 20 to 30 feet from shore at all times. We'll be swimming during slack tide, so currents and tidal action should be minimal. Although the water depth is generally not deeper than 4 feet in this section of the bay if you stay in close to shore, participants should be aware that when exiting and reentering the protected swim area of the Curley Center, you'll have to swim around a fence; the water around the end of the fence is too deep for even the tallest participants to stand up. The swim will be in close to shore. This is a “swim at your own risk” event. We encourage swimmers who get cold or tired to exit the water and walk back along the beach. Spotters will be walking the beach and will be available to assist if you need help. Kayak support and angel swimmers will also be in the water to prevent participants from swimming too far from shore and to assist swimmers who need a hand.